1. Boil the potatoes in the skins in a pot of water on the stove until they are fully cooked. Peel and cube (or shred - less work, especially if you let the food processor do it for you) the potatoes after they cool. 2. Melt the cheese and butter in a large saucepan. 3. Remove the mixture from the heat and mix in the sour cream, onions, salt, and pepper until it is fully blended. 4. Fold the potatoes into the mixture. 5. Place the potato mixture in a casserole dish and dot with the last 2 tablespoons of butter. 6. Bake in the oven at 350 degrees (F) for 25 -30 minutes until the top is golden brown. I always think of Husband's grandmother whenever I make her recipe. 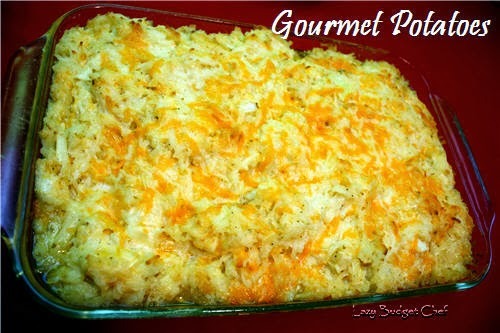 Her gourmet potato casserole not only fills my belly, it also fills my soul.